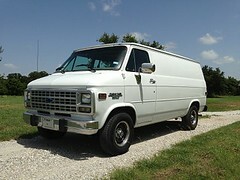 Register Log In Vannin' Community and Forums Forums General Discussion Is this really a 74? Saw this add on craigslist. Some things don't look right but I could be wrong. One, what year did that bumped out body line start? I have a '71 and a '75 and neither has it. Two, Isn't that a later dash and dog house? and three the vin sticker looks to nice to be original. Any experts out there think this might be re-vinned? I bought a van from outside of the state and had to get the vin verified by the state police because the dmv wouldn't go by just the sticker. The state police said they verified it with a second vin number stamped on the frame. Anyone know where this second vin is located? It appears to be a later body that's been " old skooled". Good looking job, I like it. It looks nice I agree but you can't just put on a 74 grill and sticker and register or sell it as a 74. That's pre smog here in CA and I'm sure it's illegal. If you get caught I would think they would make you go by the vin stamped on the frame that's why I asked if anyone knows where that is. If it's say an '84 instead it would be worth a lot less that a 74. That VIN number is for a 1974 G20 (3/4 ton) with a 350 V8. As Catfish said, it's a later model van that's been modified. I wonder what the title says? "It's a 1980 G10 Chevy Shorty Van with 74' front end"
Last edited by CatFish; August 03rd 2018 8:31 pm. never heard of a 36 gal tank. I have 33. Besides if it's a shorty it can't have a big tank. Yeah, he fixed the ad. VIN number's still wonky though.